We’d love your help. 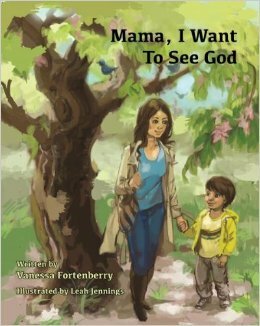 Let us know what’s wrong with this preview of Mama, I Want to See God by Vanessa Fortenberry. To ask other readers questions about Mama, I Want to See God, please sign up. In this story a child wants to see God and asks a lot of questions about visiting God, talking to him, being his friend and so forth. Questions that kids do ask because they are curious, the mother in this story has very good answers for the questions that are asked such as God is a great listener and and he loves you. God wants us to rejoice and he invites us to His table. Overall a really good book to read to kids who may have questions about God's love and what he would enjoy. I think the answers are very well thought out and honest. I have waited until I could share it with my children several times before posting my review. My 6 year old (who I call my spiritual child) really loved the story. He said that he liked reading about God's love with me, because we both love God and he likes to talk to me about it. My 7 year old wasn't as big of a fan of the book. He couldn't explain why, but maybe the story is geared a little more towards preschool and early school age children?? He did like how it talked about how God created EVERYTHING. I would definitely recommend this book. It reminds us, even adults, that we can see God in everything...from the birds that sing, to our own image in the mirror. Wow! What a beautiful shining story and such an easy read. I was highly impressed with this author’s presentation. Being an author and reaching out to our YA audience, it’s not an easy task. Surely, it took a lot of concentrated energy to speak a message of this magnitude. And the author has mastered that skill. The cover alone illuminates that there’s an exciting story, behind its pages. It is so true that the purity of children and its spirituality is radiated through this touching story. Not Wow! What a beautiful shining story and such an easy read. I was highly impressed with this author’s presentation. Being an author and reaching out to our YA audience, it’s not an easy task. Surely, it took a lot of concentrated energy to speak a message of this magnitude. And the author has mastered that skill. The cover alone illuminates that there’s an exciting story, behind its pages. It is so true that the purity of children and its spirituality is radiated through this touching story. Not only are our children precious they are very curious. And that they are. Yet, this story is not just limited to the youth its words will spark an interest to our adults alike. It wouldn’t be a surprise if this storybook was embraced on the shelves of our public school system. Certainly, it is well-written and creatively presented. Looking for that great gift? What a great gift for your next baby shower or just any occasional gift-giving event. This author has done a remarkable job. Kudos! I’m very interested in reading more from this author. Overall, it’s a great story line, with great pictures, and great job – Vanessa Fortenberry and your Illustrator Leah Jennings. Title: Mama I Want To See God. Children can ask questions that put us on the spot without even trying. The most difficult to answer are those about believing in a God one can not see or touch. They believe in the tooth fairy and Title: Mama I Want To See God. Children can ask questions that put us on the spot without even trying. The most difficult to answer are those about believing in a God one can not see or touch. They believe in the tooth fairy and Santa Claus without proof, but ask such penetrating questions when it comes to God. Vanessa offers answers children of all ages can understand, told in verse form that appeals to them. 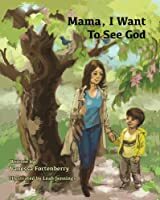 The verse along with the beautiful illustrations will have your young reader asking to read "Momma, Want To See God" again and again. The overall theme and message of this book is beautiful. I love the premise. With simplicity of words and colorful illustrations to support her message, Fortenberry communicates a story of purity. An e-copy of this title was made available by the publisher in exchange for an honest review.